It’s easy to get caught up in our professional lives and lose sight of our lives outside of our work at the County – especially if you are working “12 on, 12 off” de-icing our roads for days at a time! However, ultimately, I encourage you to maintain a healthy balance in your life – making time with friends, family, fitness and other things that are important to you like faith and hobbies. A bicyclist (not me) on the trail. We all have different ideas of what it means to be fit. 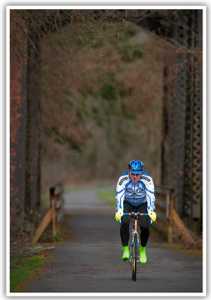 For me, it’s being able to go on my favorite 65-mile bike ride from my house to the Carbon River entrance to Mount Rainier and back again, including the Foothills Trail. When I met with the Parks and Recreation team this week I was excited to hear that the next section of the unpaved trail – from South Prairie to Buckley – will be finished this summer. I worked on funding for this connection while in the Senate and I can’t wait to try it out! I’m proud of the work we do to give people beautiful places to play and exercise. By the way, if you are hoping to catch me for a quick conversation you will need to look for me in the stairwell! That’s because I am taking the stairs as part of my wellness program. I have too many early breakfast meetings and evening community commitments to work out as consistently as I need. So, I need to take every opportunity to get my steps and cardio in when I can. 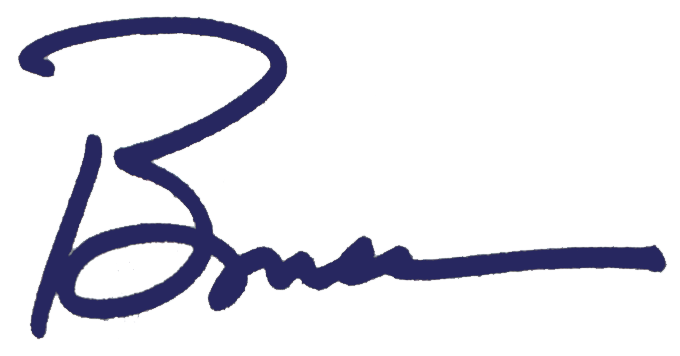 I invite you to join me as we improve our health and build a lifetime of fitness. One good place to start is with our Hubbub health app. Have you tried it? If not, check it out here. Another important element of my wellness goals is reading. Like working out, taking time to read can sometimes feel like something I can’t fit into my schedule. But, I believe that stepping back from real life and diving into another world stretches your mind and feeds your brain. Plus, there are valuable lessons to be learned. Take William Manchester’s classic, The Glory and the Dream: A Narrative History of America, 1932 – 1972. If you think that title is long, you should see the size of the book! I’m only about halfway through (1956 to be exact) but it helps give me perspective on our times and the challenges we face. If you think last November’s election was remarkable then you should read about the election of Harry Truman in 1948! 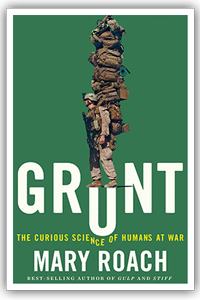 I am taking a break from The Glory and the Dream, to pick up this year’s Pierce County READS book entitled Grunt, The Curious Science of Humans at War by Mary Roach (I don’t think she is related to our two councilmembers!). It is a fascinating and quirky look at aspects of life in the military. I smile broadly in every chapter! What a great idea to have the community read a common book and discuss it at various events. The kickoff is at the Lewis Army Museum at JBLM this Saturday from 3:00 – 5:00 or you can hear directly from Mary Roach at Clover Park Technical College, McGavick Center on April 28 at 7:00 p.m.